Face-to-face business networking with other entrepreneurs is an important part of being a successful small business owner. Not only can business networking help you grow your customer base and generate referrals, but it can also provide numerous opportunities for learning, development, and growth. Explore the resources and tips outlined below to improve your business networking approach, prepare yourself to make the most out of every business networking situation, and discover how to make a positive lasting impression on your clients, customers, and peers. Before you get out there for some live, face-to-face interaction, it's a good idea to get into the right mindset. One of the best ways to ease any anxiety you may have as you prepare for a business networking situation is by developing an elevator pitch. An elevator pitch is a short description of what you do, who you work with and the value you offer to your customers or clients. The goal is to be able to deliver this "pitch" in 60 seconds or less, in a conversational way. There are many tutorials on how to write an elevator pitch to develop a pitch that hits on all of your high points. As you work to get the words of your elevator pitch just right, practice your elevator pitch with friends, co-workers or a Leads Group until you perfect your pitch. You can't network effectively as a small business owner unless you're giving yourself access to business networking situations. Small business conferences are a great way to surround yourself with other entrepreneurs and create opportunities to make valuable connections. If you choose to take a more proactive role when it comes to business networking, investing in an exhibit at a trade show may be an option for you. Business cards are essential for business networking, whether you attend a small business conference, join a local networking event, or participate in a trade show as an exhibitor. Your business card not only provides the recipient with essential contact information, but it can also reinforce your brand and make you memorable. This doesn't mean that an off-the-wall business card is right for you, though. In fact, unusual business cards can often do more damage than good. You just need a business card that passes the trash test. Business networking is an essential, and fun, part of developing a small business. 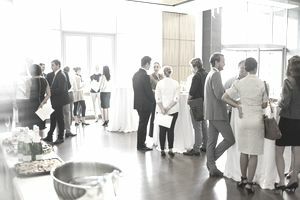 Take time to review these resources before you head out for your next networking event, and you will be ready to make a lasting first impression.